Since Valve brought its popular Steam game store and platform to the Mac, it and a handful of publishers have followed up with bringing over some popular series, including Portal, Half Life 2, and Torchlight. However, a Mac release date for the post-zombie-apocalypse Left 4 Dead series, one of Valve’s most anticipated and more recent series, has remained elusive—until now. In a post on Valve’s official Left 4 Dead blog that previews a new piece of downloadable content for Left 4 Dead, the company suggest that the new content will be available for Left 4 Dead October 5 on the PC, Xbox 360… and Mac. If the add-on is coming to the Mac, as Valve’s post states, then the actual games required to play it must be along for the ride as well. Valve, as of this writing, has not responded to Macworld’s request for confirmation. 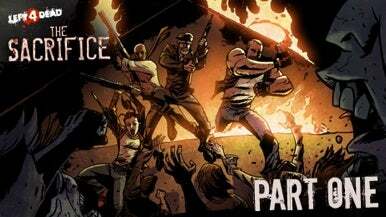 The subject of the blog post, a downloadable addition to the series called “The Sacrifice,” is a new episode for both Left 4 Dead 1 and 2 that fills in some plot details of the characters from the first game. Valve has also released a Web comic that basically spoils the fun of playing through "The Sacrifice," if that’s your thing. When Left 4 Dead does finally arrival, it will wrap up Valve’s transition of its wildly popular franchises to the Mac. Portal 2 , a sequel due in 2011, will be Valve's first game that it develops and releases at the same time for both the Mac and PC.